Ben Affleck and Jennifer Garner enjoyed a relaxing Saturday afternoon out with their kids at a restaurant in the Pacific Palisades. Always the doting dad, Ben carried 8-month-old Samuel into the restaurant and then juggled Violet and Seraphina on the way out. The girls matched in pink polka dots, while the boys kept it casual in plaid. 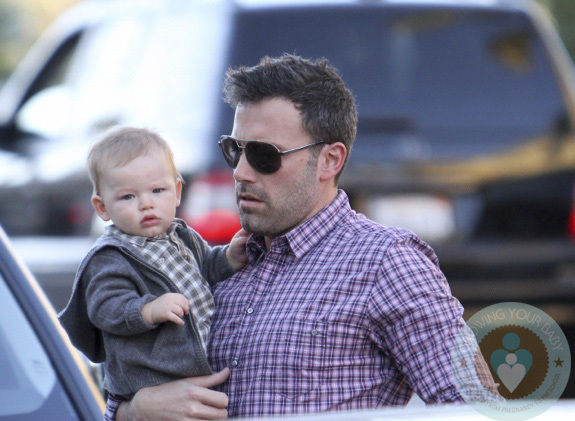 Over the last couple weeks Ben has been travelling to promote his new movie Argo. After the Los Angeles premiere he jetted off to NYC and then on to Paris, where he was joined by his wife. The actor/director continued his tour in London and Italy with the rest of the cast, which has created enough buzz to move the drama to the top of the Box Office. Aww, cute kids. I can start to see Ben’s chin in Samuel.